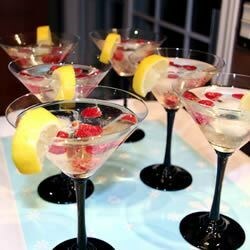 "Peach schnapps and vodka are shaken, then topped off with a splash of champagne, and a few fresh raspberries. Yuuuuuummmmm!" Pour the vodka and peach schnapps into a shaker with the ice. Shake until frothy. Strain into a martini glass, and top off with champagne. Garnish with fresh raspberries. Wow... this drink was so strong! I am going to try it again only the next time I am going to try mixing it with crushed ice... more like a slushy. MMMM MMMM goood!! This recipe is excellent! I like in in champagne flutes though, it's a little more festive! Also, drop a few raspberries in the bottom of the glass--what a great taste! Surprisingly delicious, refreshing, and not too sweet. I used pear flavored absolute and garnished with blackberries. Fab!